Nippon Telegraph and Telephone Corporation (NTT, Chiyoda-ku, Tokyo, President and CEO: Hiroo Unoura), and six partners, KDDI Research, Inc. (KDDI Research, Fujimino, Saitama, President and CEO: Yasuyuki Nakajima), Sumitomo Electric Industries, Ltd. (Sumitomo Electric, Cyuo-ku, Osaka, President: Osamu Inoue), Fujikura Ltd. (Fujikura, Koto-ku, Tokyo, President and CEO Masahiko Ito), Furukawa Electric Co., Ltd. (Furukawa, Chiyoda-ku, Tokyo, President: Keiichi Kobayashi), NEC Corporation (NEC, Minato-ku, Tokyo, President and CEO: Takashi Niino), and Chiba Institute of Technology (CIT, Narashino, Chiba, President: Kazuhito Komiya) have demonstrated the world's largest transmission capacity of 118.5 Tera-bit/s *1 using a multi-core fiber with four optical paths (cores) in the same diameter of currently used optical fiber. A conventional glass diameter (125 µm)*2 in accordance with the international standard enables us to use existing optical fiber fabrication and optical connector technologies effectively. This achievement proves the concept of multi-core fiber based long-haul and large capacity transmission system consisting of multiple vendor technologies, and it makes significant progress on practical use of the multi-core fiber technology. We will aim to introduce the standard diameter multi-core fiber by the early 2020s. We will also continue to contribute the realization of a future optical infrastructure which can support variety of data communication demands. This remarkable achievement was reported in 4 August as a postdeadline paper*3 at the Opto Electronics and Communications Conference (OECC 2017), the largest conference on optical communication in Asia Pacific-Rim, which was held at Sands Expo and Convention Centre, Singapore. This work was partially based on work commissioned by the National Institute of Information and Communications Technology (NICT). With these as backgrounds, a multi-core fiber having multiple optical paths (cores) in one fiber has been investigated intensively all over the world in order to overcome the future capacity crunch and to realize the high density or space saving optical facilities. For example, ultra large capacity transmission experiments using a multi-core fiber with 10 cores or more have been demonstrated*4 . However, these high core count multi-core fiber usually needs a thicker glass diameter, and it requires an extreme advance in the fabrication process and further development on sub-components. As a result, it is considered that 10 years or so would be necessary to make the high core count multi-core fiber practical. Proved a beyond 100 Tera-bit/s transmission using the standard diameter multi-core fiber transmission line. 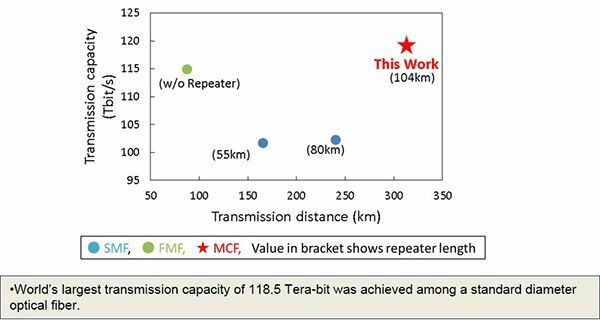 World's largest transmission capacity of 118.5 Tera-bit/s is achieved among a standard diameter optical fiber using a multi-core transmission system composed of the above multi-core transmission line, multi-core optical amplifiers, and the existing optical connectors. As a results, we successfully revealed the capacity extensionability and affinity with the existing technology of our multi-core fiber in accordance with the International standard of the current optical fiber. 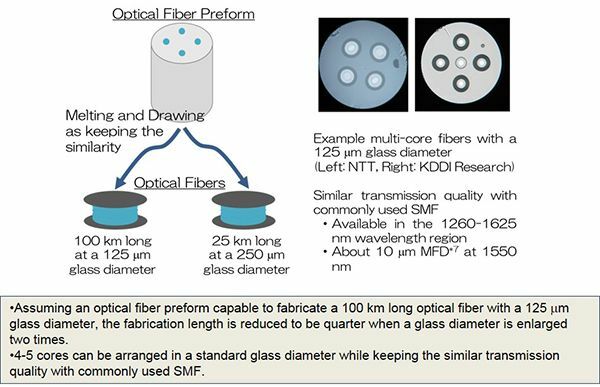 We then aim to realize a multi-core fiber with two features: i) having a glass and coating diameter of 125±0.7 µm and 235-265 µm in accordance with the International standard of the current optical fiber, ii) whose individual core can have the similar transmission quality with the commonly used SMF. In a multi-core fiber, the optical signal interference between neighboring cores*6 should be reduced sufficiently. NTT and KDDI Research revealed that 4-5 cores can be arranged in a 125 µm glass diameter. Based on the above design guideline, Sumitomo Electric, Fujikura, and Furukawa individually fabricated a multi-core fibers with four cores and more than 100 km length. All multi-core fibers can be used in the 1260 nm – 1625 nm wavelength region, and having the similar transmission property to the current SMF (cf. Mode filed diameter (MFD)*7 at 1550 nm is 9-10 µm). A multi-core transmission system was constructed by concatenating three spans. Three multi-core optical amplifiers fabricated by NEC, KDDI Research, NTT, and Furukawa were inserted at each end of three spans in order to compensate the signal attenuation. 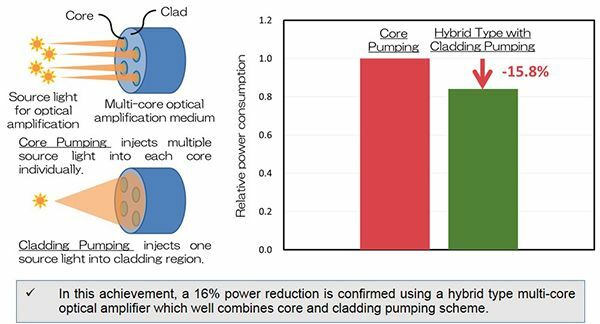 Cladding pumping type multi-core optical amplifiers which is expected to reduce power consumption were used, and a 16% improvement was confirmed in this achievement8 . In order to confirm the capability of the constructed multi-core transmission line to beyond 100 Tera-bit/s transmission, 16QAM9 based 116-wavelength signals were prepared and the output signal quality after 316 km long transmission were examined. Fan-In/Fan-Out devices10 fabricated by NTT and Furukawa were used to input/output signals to/from each core of multi-core fiber. Pluggable optical connectors11 with existing MU-type or SC-type interfaces, fabricated by CIT and NTT, were used to connect the input/output end of the multi-core transmission lines and Fan-In/Fan-Out devices. These optical connectors have rotational alignment features in order to connect the facing four-cores correctly. Thus, the low loss and pluggable optical connection of multi-core structure was achieved. Satisfactory well transmission quality was confirmed in all cores and all wavelengths, this result is the world's largest transmission capacity of 118.5 Tera-bit/s *12 among a standard diameter optical fiber. 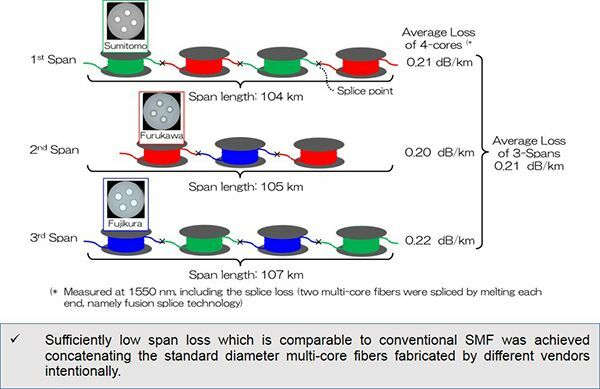 These achievements reveal that multi-core fiber with standard diameter can be used to realize an ultra large capacity transmission system overcoming the capacity crunch in the current SMF. We will aim to introduce the standard diameter multi-core fiber by the early 2020s. We will also continue to contribute the realization of a future optical infrastructure which can support variety of data communication demand. *1 Tera-bit/s Tera (Unit: T) corresponds to an amount of 1012 . 100 Tera-bit transmission enables us to transfer 500 blue-ray disks (25 Giga-byte/disk) at one second. *2 A glass diameter in accordance with International standard In accordance with the International standard, a glass and a coating (including a glass and protection regions) diameters are specified at 125±0.7 µm and 235-265 µm, respectively in order to ensure an interconnection between optical fibers provided by different vendors. *3 Postdeadline paper A technical paper that is received after the regular submission deadline. In the optical communication research field, [research groups from around the world submit their best results. A limited number of papers that receive an extremely high evaluation in a selection meeting held during the conference period are accepted for presentation in the postdeadline session. *5 Loss of optical fiber A 0.21 dB/km contains loss at splicing points. We spliced two multi-core fibers by melting each end, namely fusion splice technology. A 0.21 dB/km loss is comparable property obtained with current optical fiber. *6 Optical signal interference between neighboring cores A small portion of an optical signal is transmitted outside the core. This causes interference between different optical signals and degrades the transmission quality when neighboring cores are too close to each other. *7 Mode field diameter (MFD) A parameter which shows a diameter of optical signal propagating in an optical fiber. MFD is an important parameter for ensuring the interconnection of optical fibers provided by different manufactures because larger difference in MFD results in the connection loss increase. *8 Multi-core optical amplifier using cladding pumping In a cladding pumping based multi-core optical amplifier, pumping light as an optical amplification source is injected into the cladding region which contains multiple cores. The other hand core pumping based multi-core optical amplifier uses multiple pumping light in order to launch the amplification source light into each core individually. The cladding pumping scheme is expected to reduce the power consumption compared with that in the core pumping scheme. In this achievement, a multi-core optical amplifier fabricated by NEC realized a 16% power reduction in which core and cladding pumping were well combined, so call a hybrid type multi-core optical amplifier. *9 16QAM signal Traditional optical communication uses intensity modulation in which signals are sent using two distinct states ON and OFF to correspond to digital 0's and 1's. 16QAM (Quadrature amplitude modulation) signals are modulated by two independent optical signal components, namely I- and Q-components, using the 4-th level. This makes it possible to transfer 4×4 = 16 levels signals simultaneously. *10 Fan-In/Fan-Out device A device which enables to connect between four-individual conventional SMFs and four-cores in a multi-core fiber. In this achievement, both fiber- and waveguide-type devices were used. *11 MU-type and SC-type optical connector A pluggable optical connection technology which has been used in the current optical communication system. International standard has specified MU-, SC-, FC-types and so on based on the shape of connector. *12 World's largest 118.5 Tera-bit transmission In this achievement, 116-wavelengths with a 36 Giga-Baud (Giga corresponds to a 109 ), 16QAM (16-level = 24) modulation, and polarization multiplexed (2-orthogonal polarizations) were transmitted. 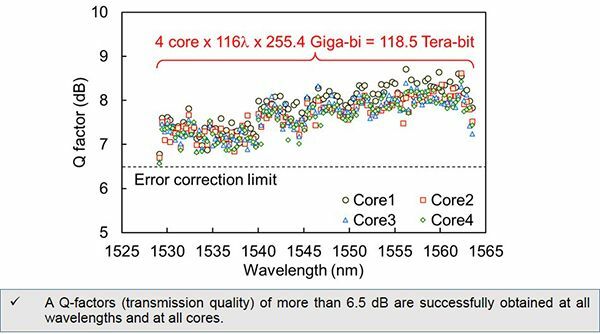 A 12.75% bit were used for error correction, thus the effective transmission capacity becomes a 118.5 Tera-bit as shown below: 116-wavelengths × log216 × 2-polarizatoins × 4-core ÷ 1.1275 (error correction) = 118.5 Tera-bit.